With Easter just around the corner, it's the perfect time to gather with friends and family for a fun afternoon and an Easter-themed Afternoon Tea in London. Treat your family or friends to our delectable Easter Afternoon Tea at The Palm Court in the Sheraton Grand London Park Lane. Sit back and enjoy a selection of freshly prepared sandwiches, plain and spiced fruit & apple hot cross scones while listening to the beautiful sounds of the harp. Our top tier of hat-shaped pastries have had a makeover into sweet Easter treats and are inspired by Lock & Co. Hatter's classic designs. The Lock & Co. Easter Afternoon Tea is available from 15th - 22nd April 2019 with free-flowing bubbles £48 per person or with Classic Tea Selection £39 per person. 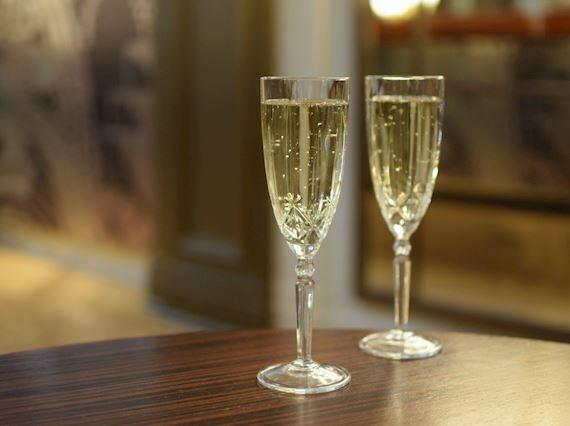 Enjoy one free glass of champagne when dining from the a la carte menu at The Palm Court. Our all day dining menu features delectable dishes like Cornish Crab & Prawn Cocktail or Lobster Omelette ‘Arnold Bennett' - the perfect pairing for a glass of champagne. This offer is available at dinner from Monday-Sunday until 31 May 2019. Tuck into a tempting selection of luxury sandwiches, savor freshly baked scones and enjoy finely crafted hat-shaped pastries, inspired by Lock & Co. Hatters classic designs. Our pastry team have finely crafted each sweet on the menu to replicate Lock & Co.'s classic designs. Such as the Drab shell top hat with Banana lime cream, gingerbread sponge and The Bowler, a Black forest maraschino vanilla mousse with black cherry jam and chocolate brownie. The menu also features freshly baked plain and chocolate and orange raisin scones served with homemade selection of seasonal preserves and clotted cream. The tempting selection of luxury sandwiches includes smoked salmon with herb cream cheese and capers, and maple roasted gammon with apple chilli jam. Enjoy your Afternoon Tea with free-flowing bubbles £48 per person or with Classic Tea Selection £39 per person. Immerse yourself in the glamorous spirit of the 1920s: each Wednesday night, when the clock strikes 19:20, the Art Deco lounge at the heart of the hotel, The Palm Court, will transform into a Roaring 20s party, for just one magical hour. Having first opened in 1927, at the height of the Jazz Age, Sheraton Grand London Park Lane has a long history of bringing people together in the heart of Mayfair. The iconic Palm Court retains its 1920s heritage with elegant Art Deco details and a stunning stained glass ceiling, providing the perfect backdrop for the dazzling 20s experience. Enjoy stunning, classic drinks reminiscent of the Jazz Age, including a French 75 and Aviation, while we turn back the clocks for an all-singing, all-dancing hour of Roaring 20s glamour.